After 3 weeks of fermentation and 1 month of lagering, the Session Helles is wonderful and incredibly refreshing. Intended to grow lager yeast for future batches, this small batch re-brew of a session-style Munich Helles came out great. A review and recipe below. Cheers, and happy brewing! 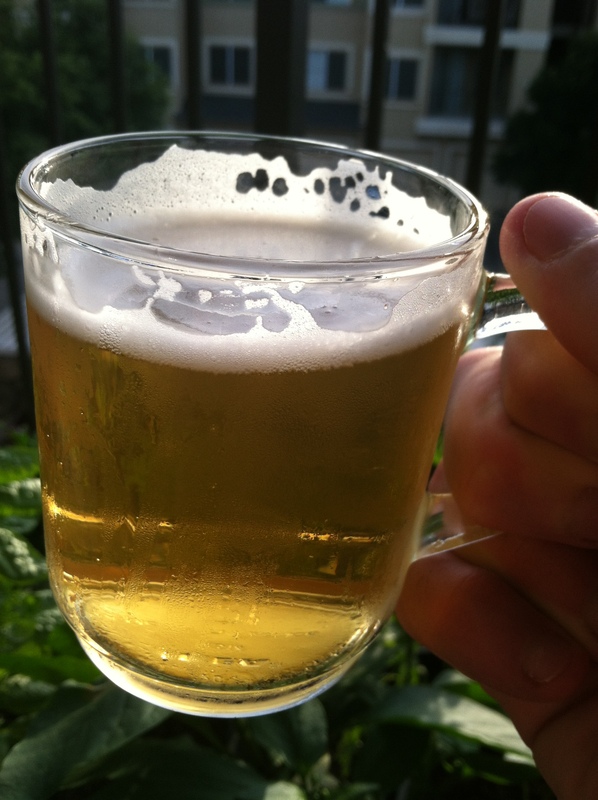 Pouring into a teacup, the Session Helles has a clear, pale gold appearance with fine white head. The aroma is malt-forward, clean, grainy in character with slight candy-like sweetness. In tasting, more of the same: grainy malt with notes of toast along with a clean malt sweetness. On the palette, the beer finishes very crisp and clean, lager-like with the malt sweetness up front and finishing dry. At ~4.1% ABV, this beer does its job: characterful and interesting for the craft beer enthusiast yet quaffable and clean for the light beer drinkers. In my apartment, this is my go-to light summer brew. Also, while planning ahead for the Fall season, this starter batch grows plenty of yeast for my strong German lagers. This recipe was a re-brew of last years Lite Helles. I enjoyed that beer very much, and had to re-brew it for the 2014 Summer season. Essentially, the recipe is modified from Jamil’s Brewing Classical Styles book. Most everything is the same with except cuts back on the pilsner malt in the grist to yield a starting gravity near 1.040. Also, the batch was scaled down to 4 gallons, as this was the largest batch I could justify while maintaining appropriate lager pitching rates (see note below). As mentioned above, this recipe does double duty: making a nice light lager for the hot summertime months while growing lots of lager yeast for my strong Fall season German lagers. This recipe leaves the color light, starting gravity and bitterness low, making the harvested yeast prime for re-pitching. For a future re-brew, I will likely keep everything the same. As I said, I like this recipe very much, and was recently well-reviewed by my homebrew club, the Austin Zealots. If you want to play around, I recommend trying Wyeast Munich Lager yeast strain. Alternatively, if you can’t achieve proper lager fermentation temperatures, I would recommend White Labs San Francisco Lager yeast strain; it ferments very lager-like up to 64 F when proper aeration and pitch rates are observed. When your brewing practices are dialled-in to produce nice, clean light lagers, give this recipe a try. Comparing across all beer styles, the Session Helles recipe requires a very clean and attenuative fermentation, as any fermentation flaw will be apparent due to its low malt and hop profile. If you plan to direct pitch a single fresh vial or smack pack (as I did), the four gallon recipe below is for the warm-pitch method only (also as I did). Unfamiliar with warm-pitch lagers? Essentially, this technique allows you to pitch fewer lager yeast cells by adopting a warm ale-temperature growth stage before chilling to lager fermentation temperatures. When properly done, the resulting brew produces a very clean lager. More info on the warm-pitch method is detailed here by White Labs. If you prefer direct pitching at lager temperatures, consider scaling this recipe down to 2.5 gallons for improved fermentation. Alternatively, making 2L starter will work well for either recipe and is a must if the liquid yeast is less than fresh. Have you brewed a session lager or made a starter batch? Leave your experiences in the comment section below. Cheers, and happy brewing! Hey there! I just wanted to let you know that I enjoy reading your blog, and that I nominated you for a Wonderful Readership Award (http://lovefoodandbeer.com/2014/08/13/passing-it-on-the-wonderful-team-readership-award/)! Please pass it on, and keep up the good writing! Sorry if this post is redundant – but I really like your blog! Hey thanks! It is much appreciated. I’ll pass it on through next weeks Weekly Update post. Cheers! « Small Batch Brewing: Lab-grade Yeast Pitching Rate: Part 1, What is Pitch Rate?